Mennonite Encyclopedia, Vol. 2, p. 434'']] Galicia, until [[World War (1914-1918)|World War I]] a part of the Austro-Hungarian Empire, thereafter Polish until 1939. About 3,300 German families, including 28 Mennonite families, settled in the vicinity of [[view|Lemberg]]<em>, </em>when [[Joseph II, Holy Roman Emperor (1741-1790)|Emperor Joseph II]] invited colonization in the patent of 17 September 1781. They came for the most part from the [[Palatinate (Rheinland-Pfalz, Germany)|Palatinate]]. The oldest church record states that they came from various parts of [[Germany|Germany]], and were of Swiss origin. In 1784 they lived in three newly laid out neighboring communities, Einsiedel (18), [[Falkenstein (Galicia, Poland)|Falkenstein]] (7), and Rosenberg (3 families). All three places were in the county of Szczerzec (Shchirets), about three miles southwest of Lemberg. Mennonite Encyclopedia, Vol. 2, p. 434'']] Galicia, until [[World War (1914-1918)|World War I]] a part of the Austro-Hungarian Empire, thereafter Polish until 1939. 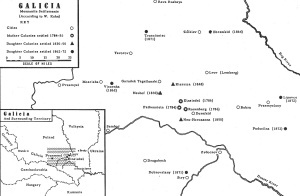 About 3,300 German families, including 28 Mennonite families, settled in the vicinity of [[Lemberg (Lviv Oblast, Ukraine)|Lemberg]]<em>, </em>when [[Joseph II, Holy Roman Emperor (1741-1790)|Emperor Joseph II]] invited colonization in the patent of 17 September 1781. They came for the most part from the [[Palatinate (Rheinland-Pfalz, Germany)|Palatinate]]. The oldest church record states that they came from various parts of [[Germany|Germany]], and were of Swiss origin. In 1784 they lived in three newly laid out neighboring communities, Einsiedel (18), [[Falkenstein (Galicia, Poland)|Falkenstein]] (7), and Rosenberg (3 families). All three places were in the county of Szczerzec (Shchirets), about three miles southwest of Lemberg. Hege, Christian and Christian Neff. Mennonitisches Lexikon, 4 vols. Frankfurt & Weierhof: Hege; Karlsruhe; Schneider, 1913-1967: v. II, 29 f.
Pauls, H. and Cornelius Krahn. "Galicia (Poland & Ukraine)." Global Anabaptist Mennonite Encyclopedia Online. 1956. Web. 25 Apr 2019. http://gameo.org/index.php?title=Galicia_(Poland_%26_Ukraine)&oldid=100285. Pauls, H. and Cornelius Krahn. (1956). Galicia (Poland & Ukraine). Global Anabaptist Mennonite Encyclopedia Online. Retrieved 25 April 2019, from http://gameo.org/index.php?title=Galicia_(Poland_%26_Ukraine)&oldid=100285.